Tonight is for around 24 lucky people plus friends a mini #openit night, featuring Hardknott Brewery. I’m one of those fortunate chosen few thanks to Dave and Alex at the brewery and have decided to share mine with a few friends. The plan was to open it in a Macclesfield pub but the British weather put an end to that with all transport links cut off it seems. This is going to be a short and sweet review as we are on the move and I didn’t want to miss the boat by writing it up later. Rhetoric is very boozy on the nose which masks some of the smells behind it, but I’m picking up dried fruit, slightly spicy with almost a Christmas beer type notes. There’s also pears and strawberry too as a background undercurrent. The taste is very sweet and you see why this would benefit from ageing, it has a bit of a sherry like character to it, pleasant drinking and definitely a sipper. There’s dark slightly toasted caramelised/candied orange fruit flavour coming through, with a definite Cointreau liqueur edge. The general consensus from the gathered throng is good, everyone had enjoyed the beer, some said a little sweet but I’m sure that will develop over time. 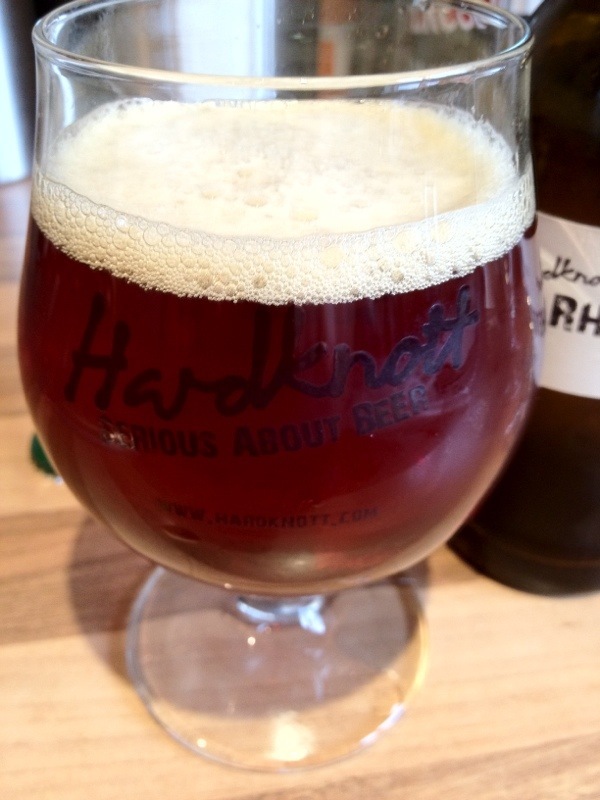 Cheers to the guys at Hardknott for sharing this. Apologies for any spelling gaffs etc above, doing this via iPhone so will amend tomorrow. 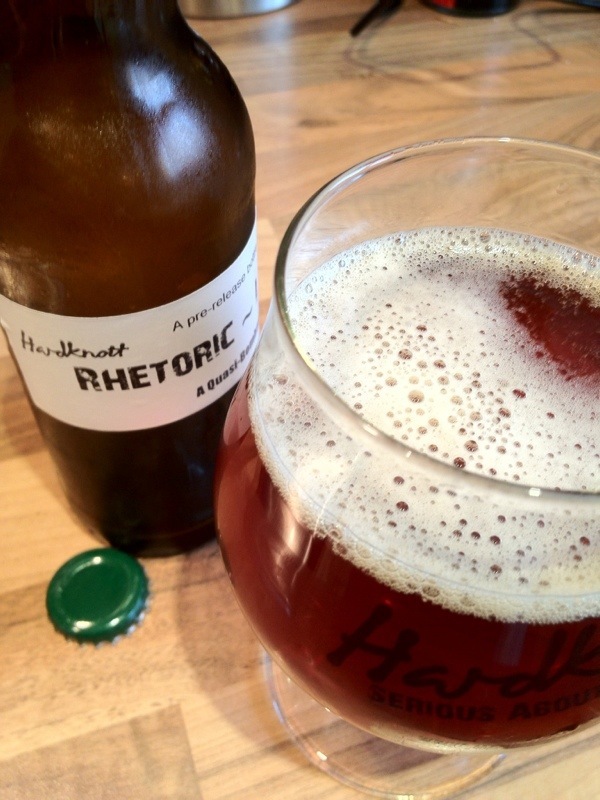 If you want to read all about the idea behind the Rhetoric range of experimental beers you can check it out here on Hardknott Dave’s Blog. To get your hands on some visit the Hardknott online store, pick up some other gems while you are there too. 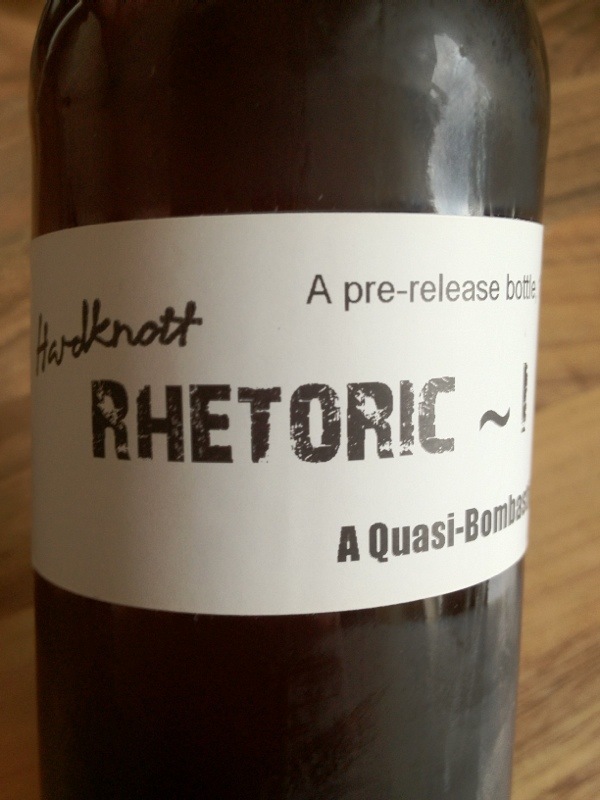 This entry was posted in Beer Reviews and tagged Beer, Hardknott Brewery, Rhetoric by Phil. Bookmark the permalink.